Microsoft has announced its onslaught on Apple by introducing new Surface Laptop along with the new Surface Arc Mouse. The mouse bears futuristic outlook and would give a tough fight to Apple’s Magic Mouse. This new peripheral has been designed to compliment the sleek design of Surface Laptop. The company touts the new Surface Arc Mouse to be “slim, light, and ready to travel.” Microsoft also boasts about the easy-to-fit design of the mouse by calling it “designed to conform to your hand.” The new Surface Arc Mouse is similar to the previous Arc Mouse that had an adjustable design to slide into bags easily by becoming flat with the touch of a button and then getting back into the arc shape as per user’s need. Also, the mouse can be used in the flat shape, and it would also save battery. The overall design of Surface Arc Mouse is optimized for the most comfortable, natural interaction. Simply snap it into its curved position to power it up, then snap again to flatten and power down. Ultra-slim and lightweight, Surface Arc Mouse, goes anywhere without the weight or bulk of traditional mice. Just snap it flat and easily slip it in your pocket or bag. Microsoft’s new Surface Arc Mouse comes with left-click and right-click buttons. It is available in three color options – Burgundy, Light Grey, and Cobalt Blue. The mouse also features a touch-sensitive ‘scroll plane’ that lets users scroll up and down or left-right by swiping their fingers on the panel. This function is also pretty much like the one we have seen on Apple’s Magic Mouse. 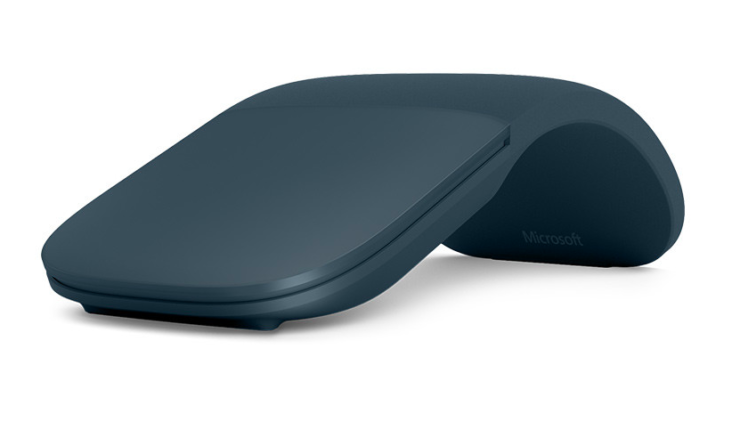 The new Surface Arc Mouse connects to a device that has Bluetooth 4.0 or above. It comes with support for Windows 8, Windows 8.1 and the Windows 10. The device will be available for $79.99 in the US and is already up for pre-ordering on Microsoft’s online store. The shipments will be starting from June 15. The Surface Laptop will also start shipping on the same date. In the meantime, you can check out this video for the new Surface Arc Mouse posted by Microsoft.